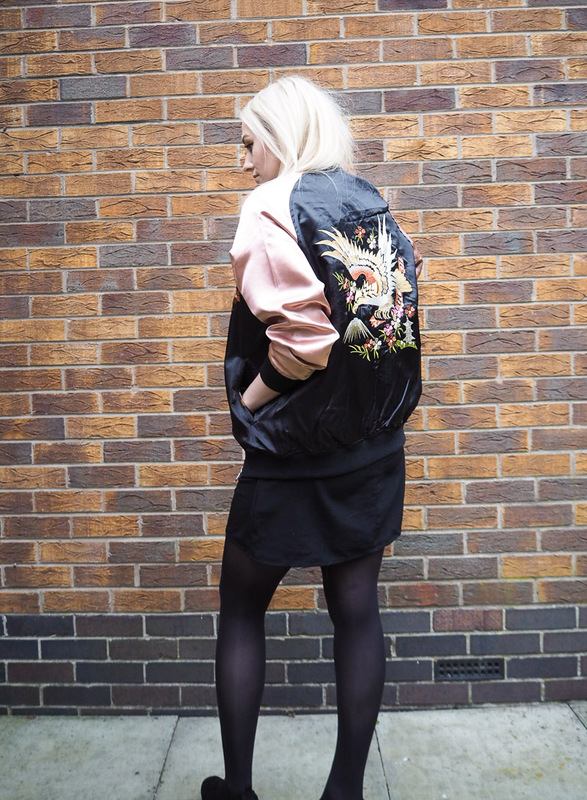 A couple of weeks ago, I shared with you my favourite bomber jackets around at the moment. Although I loved each and every one of them, there was one in particular that I just couldn’t get enough of and the more I looked at it, the more I fell in love. It was definitely my favourite. I eventually managed to get it and I can’t believe it’s mine, I love it so much. 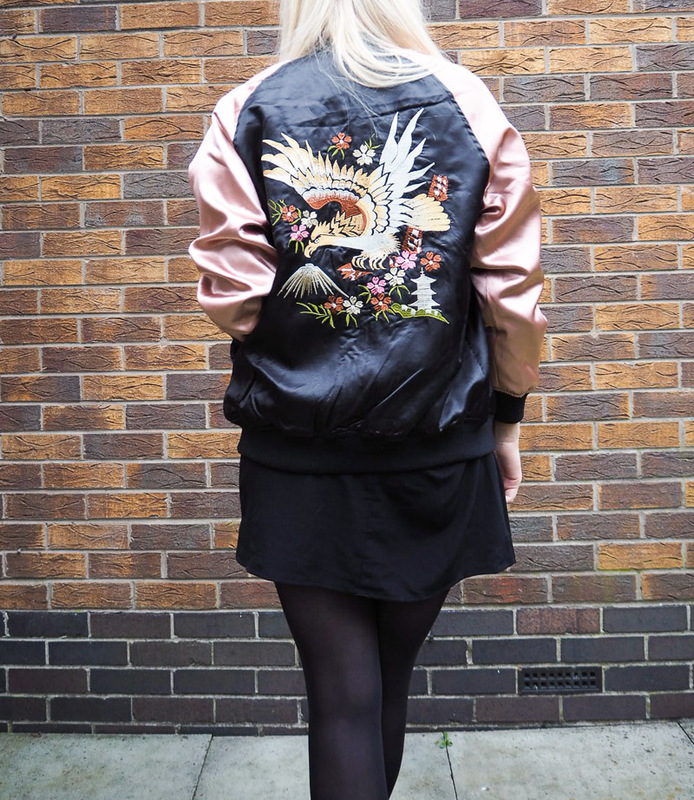 So, say hello to my utter dreamboat of a bomber jacket. Look at it! It’s just so gorgeous. This premium floral embroidered beauty of a jacket is perfect for me. I love the silky fabric, the black and soft pink colours, the beautiful embroidery, and the oversized fit. It’s quite a thin material, so it’s still a little too chilly to wear without some layers, but it means it will do me throughout spring and the upcoming summer (which, let’s face it, is rarely nice and hot here in the UK). The detailing on the back is probably my favourite aspect about it, it’s stunning. I plan on wearing it lots of different ways, but for today’s post I wanted to keep all the focus on the jacket and really let it make a statement. I decided to pair it with a simple little black shift dress, and although you can’t see them it actually has 3/4 length sleeves. My shoes are the glove style ones I featured in my last outfit post which are my current go to shoes. The glove style and block heel is right on trend for this season. They’re simplicity made them pair really well with the rest of this outfit, and keeping it quite feminine and simple contrasted nicely with the casual coolness of the bomber shape. Plus the floral embroidery is right in keeping with my typical girly style. It’s going to look great paired with denim and I can’t wait to wear it with some cute summer dresses. I absolutely adore this bomber jacket on you. Suits you so well and what you've worn it with looks gorgeous! I think bomber jacket are a must have for springtime! Love your look sooo much!! This is such a cool look. I love your jacket so much. I think the embroidery gives it an extra glam factor. I've been seeing the bomber jackets everywhere and I absolutely love them! I think it's time for me to get one haha. I really love the embroidered back of this one and love that it gives it some character. Definitely a great choice! Can't wait to see you style it again:). Hope u have an awesome weekend! I couldn't agree more girl, this bomber is da bomb (bad humour I know haha)! But seriously, this outfit is so gorgeous and suits you very well! Stunning look overall, and love the pastel pink vibes in comnination with the overall dark look! 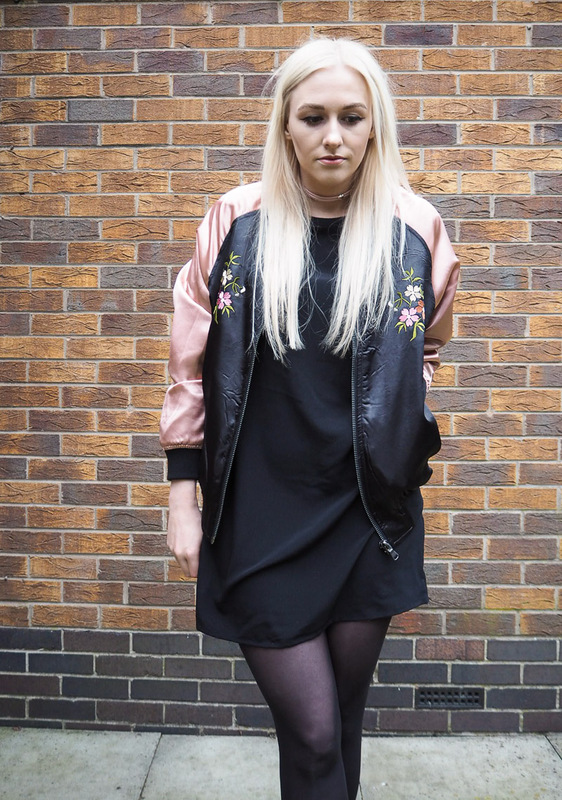 loving the bomber, edgy but still girly with the pink and floral print. That bomber looks amazing on you! Loving the colours and the detailing, its stunning!